The word Navaratri literally means nine nights in Sanskrit, nava meaning nine and ratri meaning nights. 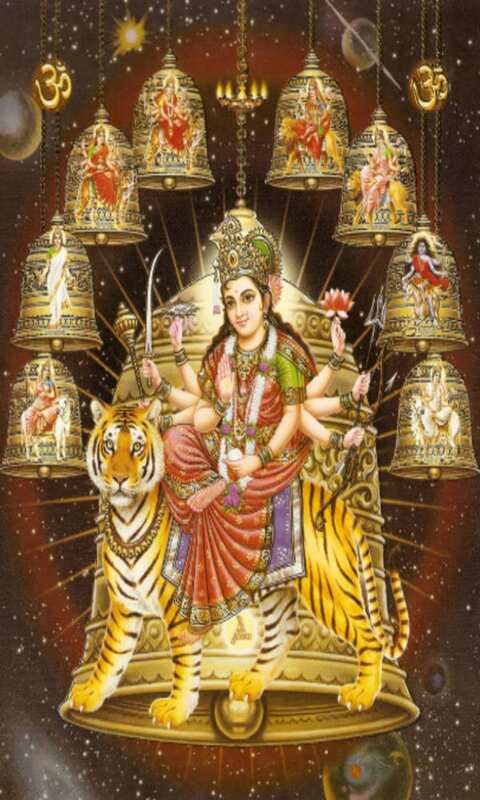 During these nine nights and ten days, nine forms of Shakti / Devi are worshiped. The seeds of inner renewal are sown, sprouting, watched & worshiped by devotees during Navratri and on the 8th, 9th and 10th days, Goddess Durga, Mahanavami and Vijayashtami are worshipped. The tenth day that is commonly referred to as Vijayadashami or “Dussehra”, celebrates victory of Shakti over Mahishasura, of Lord Rama over Ravana, and of Durga over demons like Madhu-Kaitav, Chanda-Munda and Shumbha-Nishumbha; that is victory of good over evil. The last 3 days of Navratri are called Durgashtami (8th day), Mahanavami (9th day) and Vijayadasami (10th day). On the morning of the tenth day there is a fire ceremony dedicated to Shiva, where the Navaratri participants have a chance to receive Shiva’s blessing. The beginning of spring and the beginning of autumn are considered to be important junctions of climatic and solar influences. That is why these two periods are taken as sacred opportunities for the worship of the Divine Mother Durga. The dates of the festival are determined according to the lunar calendar. Navratri is a very important and major festival in the western states of India: Gujarat, Maharashtra, and Karnataka during which the traditional dance of Gujarat called “Garba” is widely performed. This festival is celebrated with great zeal in North India as well, including Bihar, West Bengal, Madhya Pradesh and the northern state of Punjab. Durga, the Mother Goddess of the Hindus and a form of Devi and Shakti, is believed to have manifested in various forms, and Navadurga Maa are believed to be the most sacred aspects of Goddess Durga. According to a Hindu tradition, it is believed that there are three major forms in which Goddess Durga manifested herself, namely, Mahasaraswati, Mahalakshmi and Mahakali who are the active energies (Shakti) of Brahma, Vishnu and Rudra respectively (without these goddesses the gods will lose all their powers). Devi Maa Shailputri – The Navratri commences with the 1st night devoted to the puja of Maa “Shailputri”. “Shail” means mountains; “Parvati”, the daughter of king of Mountains Himavan, is known as “Shailputri”. Her 2 hands, display a trident and a lotus. She is mounted upon a bull. Devi Maa Brahmacharini – One hand holds a “Kumbha” or water port and the other rosary. She personifies love and loyalty. Maa Brahmacharini is a store-house of knowledge and wisdom. Rudraksha is her most adorned ornament. Devi Maa Chandraghanta – Worshipped on the 3rd night this Maa Durga “Shakti” is astride a tiger, displays a golden hue to Her skin, possesses ten hands and 3 eyes. Eight of Her hands display weapons while the remaining two are respectively in the mudras of gestures of boon giving and stopping harm. Chandra + Ghanta, meaning supreme bliss and knowledge, showering peace and serenity, like cool breeze in a moonlit night. Devi Maa Kushmanda – The 4th night begins the worship of Maa “Kushmanda”, possessed of eight arms, holding weapons and a mala or rosary. Her mount is a tiger and She emanates a solar like aura. “Kumbh Bhand” means to see cosmic vivacity in Pindi shape or knowledge of cosmic intricacies in human race. The abode of Maa “Kushmanda” is in Bhimaparvat. Devi Maa Skandamata – Using a lion as a vehicle She holds her son, “Skand” in her lap while displaying 3 eyes and 4 hands; two hands hold lotuses while the other 2 hands respectively display defending and granting gestures. Its said, by the mercy of Maa “Skandmata”, even the idiot becomes an ocean of knowledge such as “Kalidas”. Devi Maa Katyayani – As mother, Maa “Katyayani” stayed in the Ashram of sage Katyayan for penance, hence She named as “Katyayani”. This 6th Shakti is also astride a lion with 3 eyes and 4 arms. One left hand holds a weapon and the other a lotus. The other 2 hands respectively display defending and granting gestures. Her complexion is golden coloured.